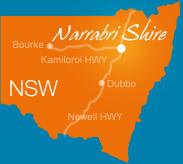 General Media enquiries can be directed to Council's Communications Coordinator on (02) 6799 6866 or email council@narrabri.nsw.gov.au. Every week Council produces a half page advertorial in the local newspaper - The Courier. Council in Focus is a quarterly newsletter that is distributed through the Council's Rates Notices.